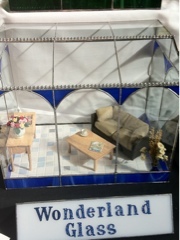 If you were at Miniatura in March you may well have spotted these lovelies on the Wonderland glass stand? 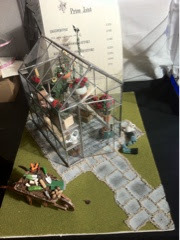 It was maker Jacqui's first time at the show, we got a super friendly welcome,and, she very kindly let me take some pics! 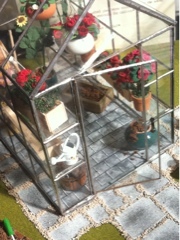 Specialising in 1:12 scale conservatories, room boxes and greenhouses these little buildings are fab if you're thinking of extending this Summer! Each one is made from scratch by Jacqui, using stain glass techniques, they're gorgeous as stand alone pieces or as a sweet summery addition to your dolls house. There's lots of different colour options available and more designs being developed as we speak. Exciting!! 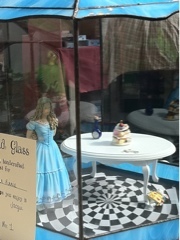 I heart the Alice in wonderland roombox, the floor makes my eyes go all Topsy-turvy! The Dolls house magazine: Four Little Walls column! !